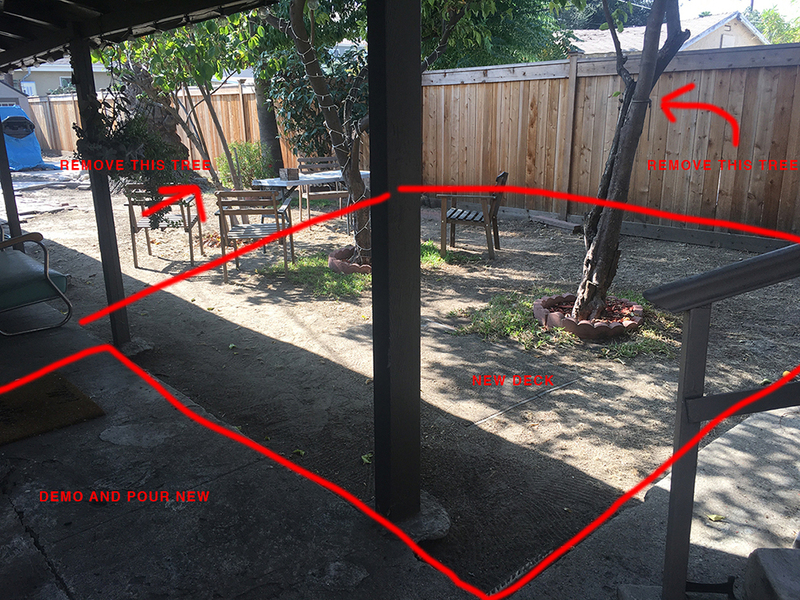 The California Cottage: Backyard Overhaul AKA the Most Annoying Renovation Ever. pin it!My small house is on a very large lot that is only 25 feet wide but almost 200 feet long. The lot is flat, so all the land is 100% usable for pretty much whatever I want — a veggie garden, a pool, an art studio… so many possibilities. 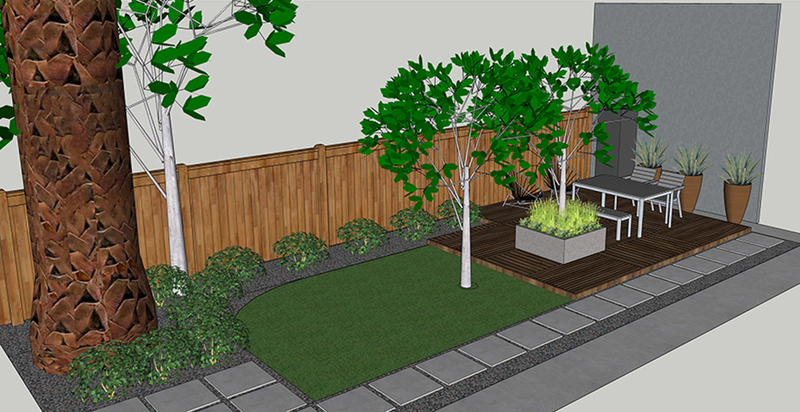 I always knew that this yard had huge potential but landscaping is exorbitantly expensive so for the longest time I just didn’t have the willpower or the funds to make something like that happen. 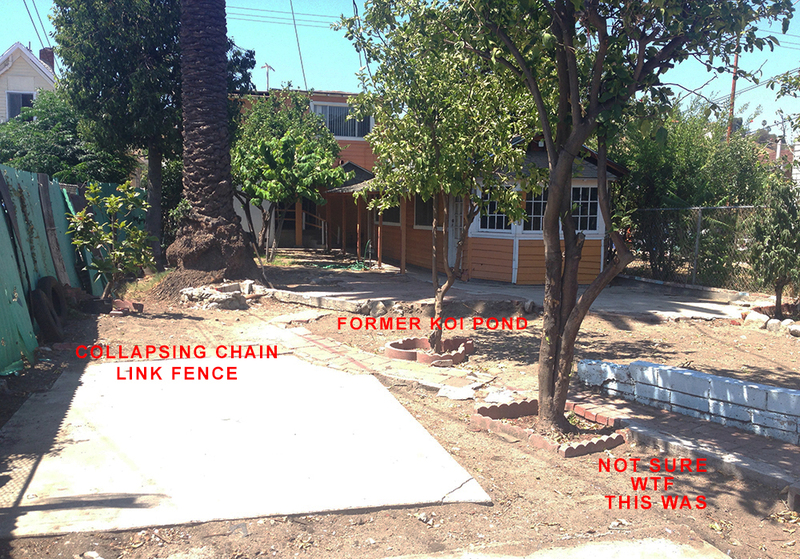 My front yard and backyard were a massive eyesore. The chain-link fence was falling over, the grass was all dead, and the cement walkways were poured badly and looked terrible. 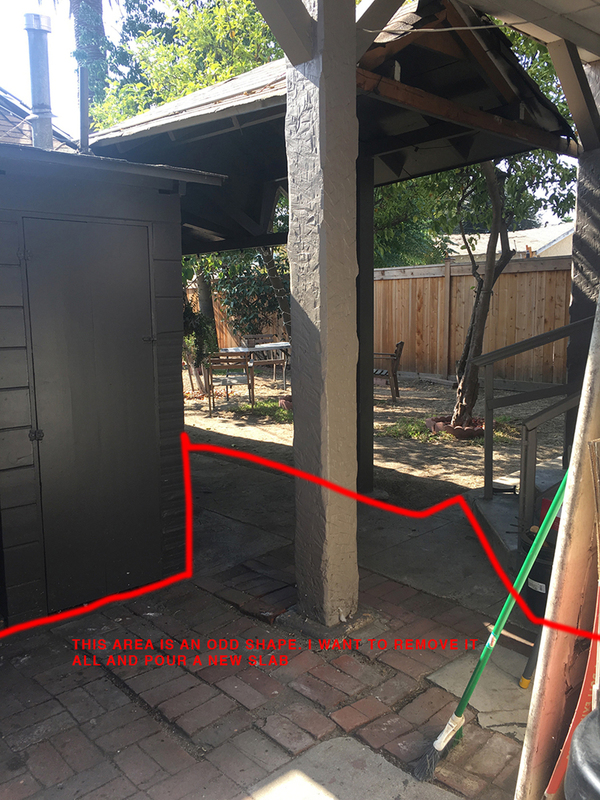 The previous owners had a KOI POND at some point, which resulted in awkward hills and valleys as well as all kinds of weird concrete and brick debris. The little cottage that I live in is tucked in the backyard of my property. It has 14 windows, 13 of which looked out onto my dirt-blob yard. For years I just kept the blinds drawn to avoid looking at it, but as soon as I had the money saved, I decided to start designing. My main motivation for her embarking on this yard renovation was to manage the dust. Los Angeles is in a drought most of the time so the soil here has no weight to it. Every time the wind blows, tons of dust flies all over the yard and somehow ends up all over the inside and outside of my yard. No matter how much I swept there was no controlling the dust. The first step was to hire somebody to demolish all the little bits and pieces of leftover projects so we could start with a blank slate. I can’t decide if that made it look better or worse. Sorry about the ugly pictures and ugly notes, but there’s really no better way to convey this information! 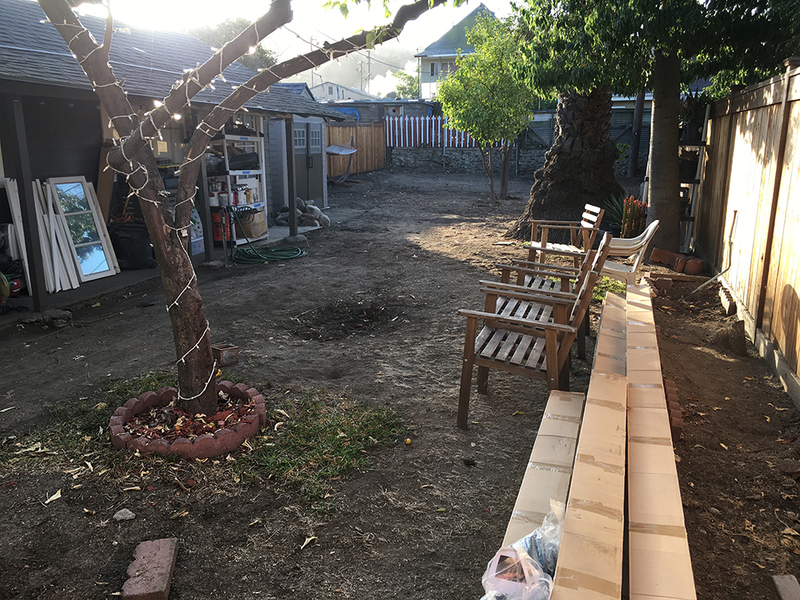 This is the area between my main house and my cottage — a 6′ wide path composed of 5 separate concrete slabs and mismatched bricks that were not secured in any way. 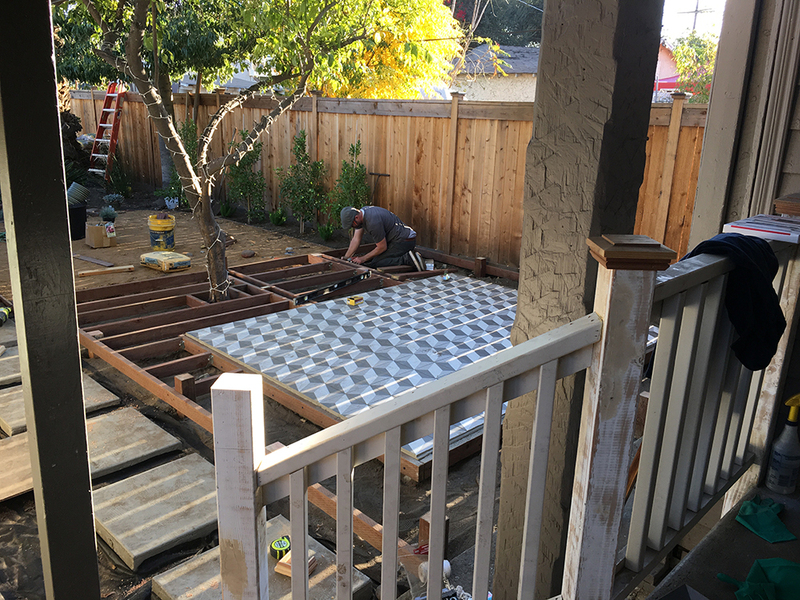 My dream was to walk out the door onto a beautiful, new deck. Unfortunately, someone planted 3 trees right in the middle of the area outside my house, so there was no room for a deck. I decided that I didn’t need 5 lemon trees, so I had two removed. I also removed 4 or 5 smaller bushes and shrubs that were poorly placed. pin it! 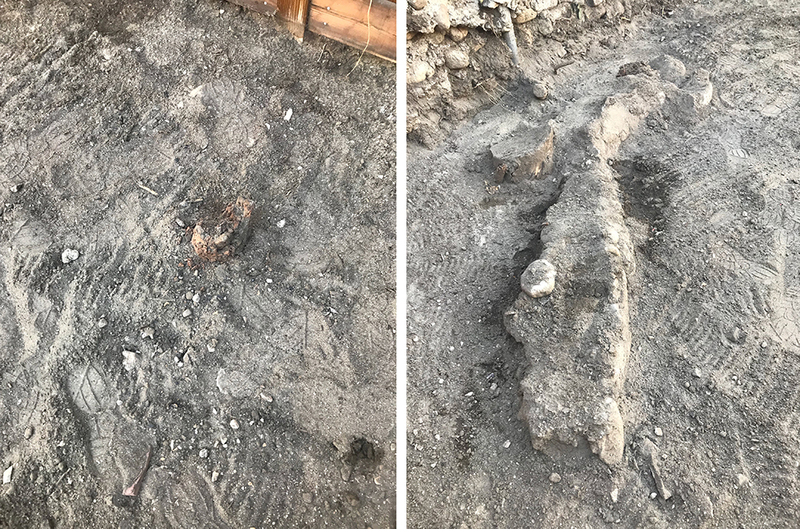 This is what much of the concrete looked like on my property. I think this is a result of someone doing a skim coat over an old slab without proper preparation, so the top layer chipped off over time. 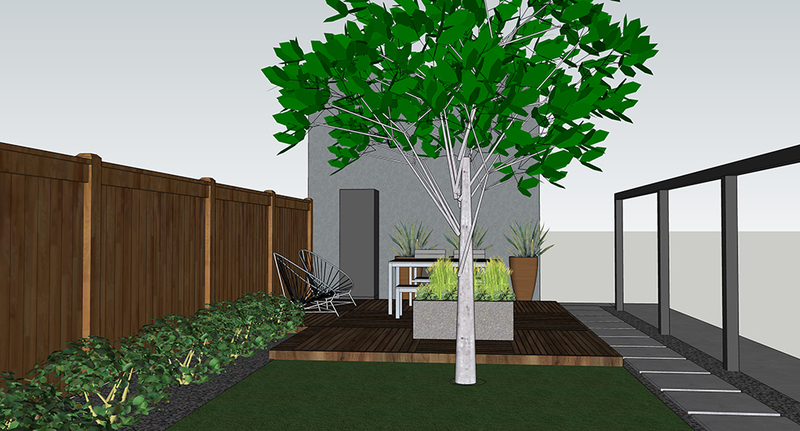 pin it!I am relatively experienced when it comes to interior design, but landscaping was all new to me so I did what any civilian would do – I went on Pinterest and started pinning. I put a good 200+ hours into the design and research over the course of 6 months. 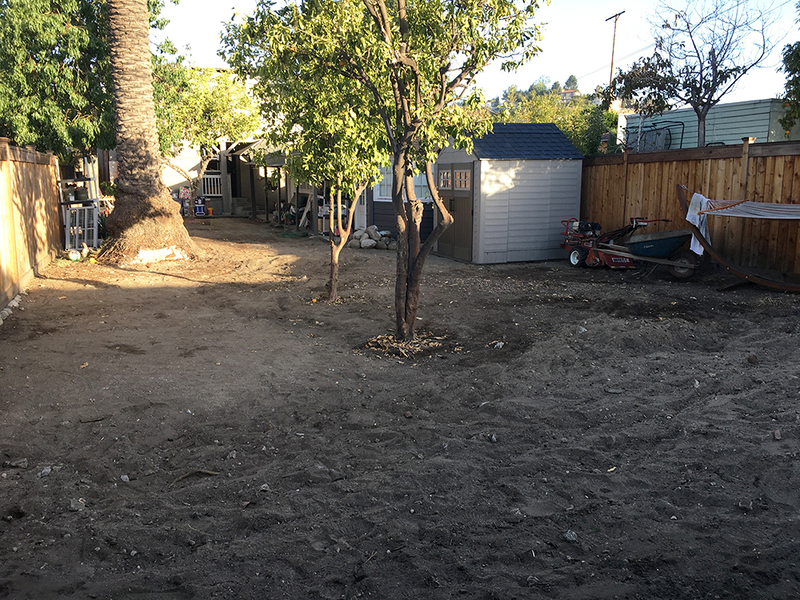 It became clear to me that if I was going to renovate this yard it would be a 100% complete demolition and rebuild. I didn’t know any landscape contractors at the time, and finding one who was available ASAP was a challenge. Most of the reputable companies weren’t available for two or three months. I eventually found a contractor who was local and seemed to run a legit business. I’m an extremely detail oriented person and I did so many drawings, sketches, and lists to convey what I wanted. 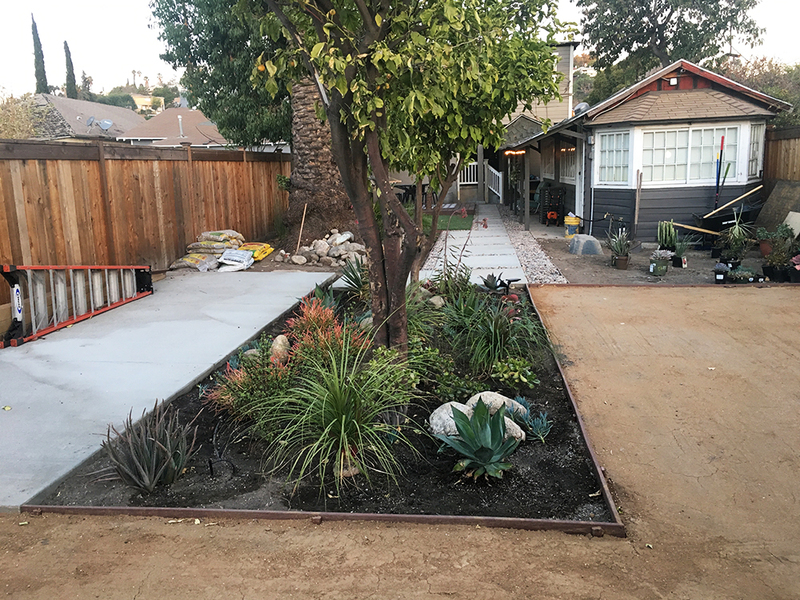 From the beginning there were misunderstandings, changes, and additions, and my contractor definitely charged me for every single little thing. 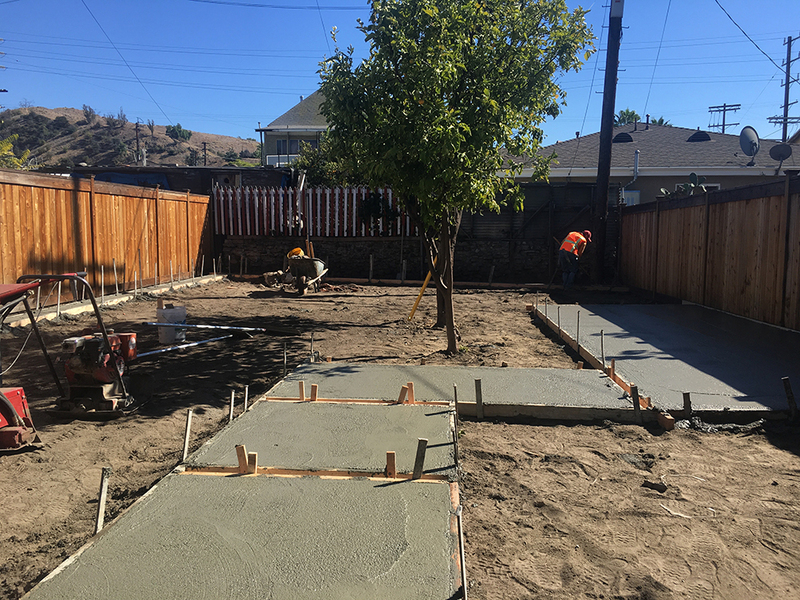 For example, I meticulously measured out where I wanted all of my concrete slabs to be poured. All of the forms were laid and the concrete was poured on the same day – a day when I was at work. I left during my lunch break to check it out and for the most part, it was all fine. 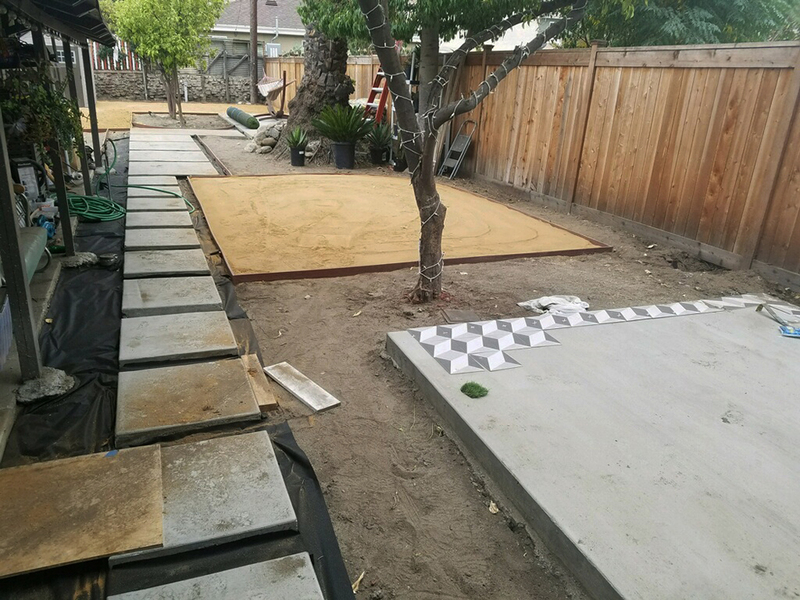 However, I definitely told the contractor that I wanted him to make the yard all one level. 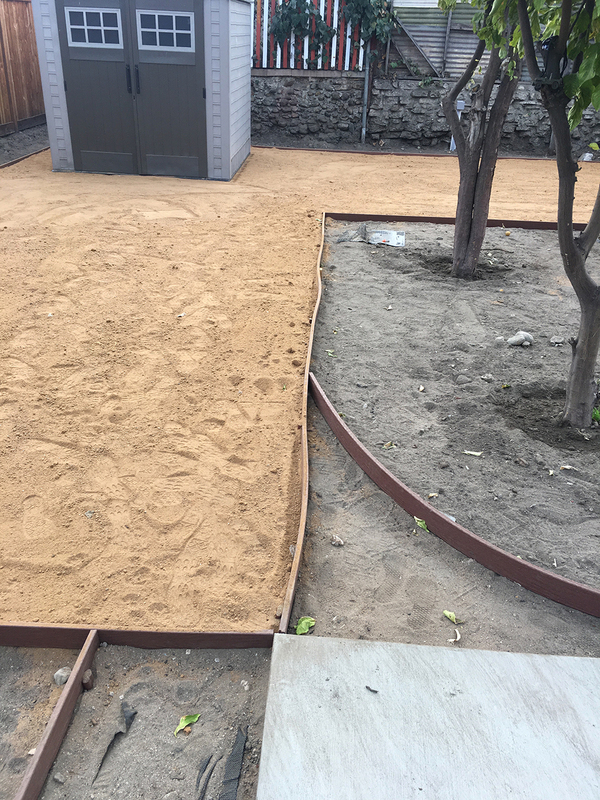 He took that as me wanting the yard to be flat but at a slant, and he went ahead and poured a concrete border along the entire back of my yard at an angle. When I came home from lunch, I freaked out because it looked ridiculous. The boss wasn’t there and I called him right away and told him that this was not at all what I wanted. 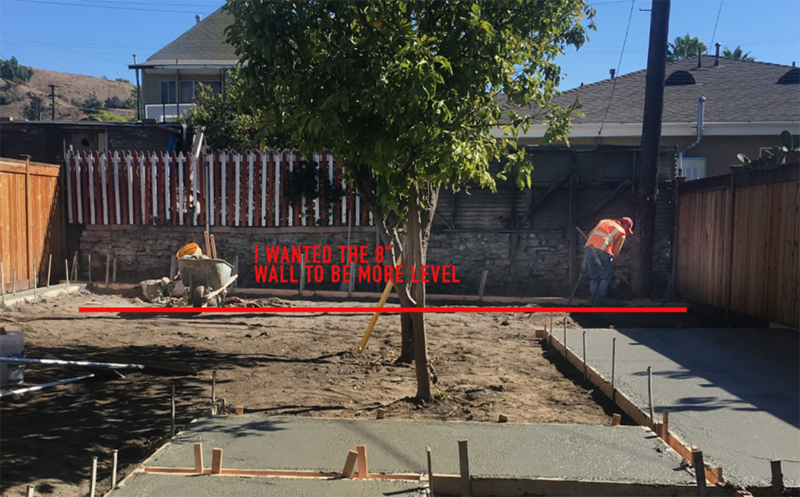 We ended up having to demolish the freshly poured retaining wall and grading the soil which added $2k+ to my already huge estimate. pin it! pin it!Every time my contractor would find the smallest thing in the ground like a tree stump or a small blob of concrete he would charge me $1000 to take it out. I mean, look at these blobs in the dirt. He actually charge me $1000 to remove them. The most annoying thing about working with a contractor is that once you’re neck-deep in all that mess, the only way to make the suffering stop is to get it over with. 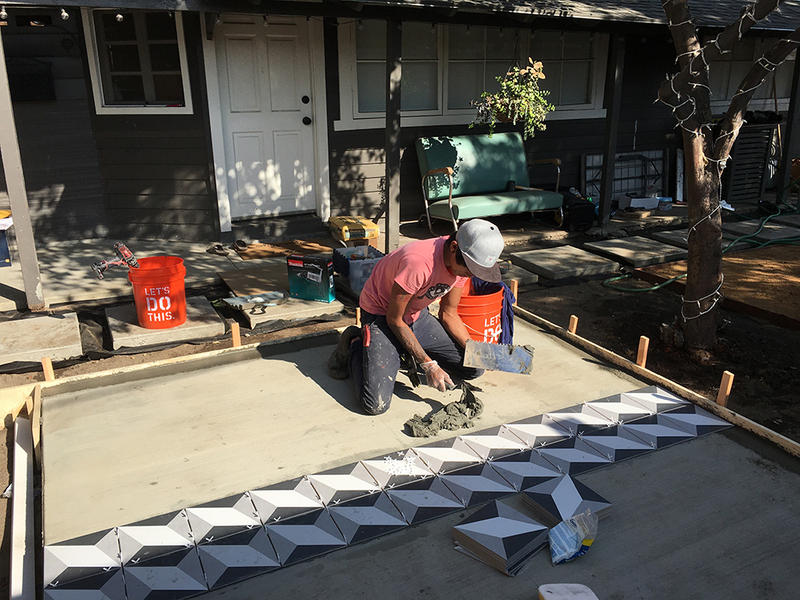 Contractors are in a very good position to charge exorbitant amounts for overages/additions because they know that the homeowner is somewhat desperate and feels like it’s too late to start over and form a new relationship with a new company. This is another example of my contractor charging me ridiculous overages. 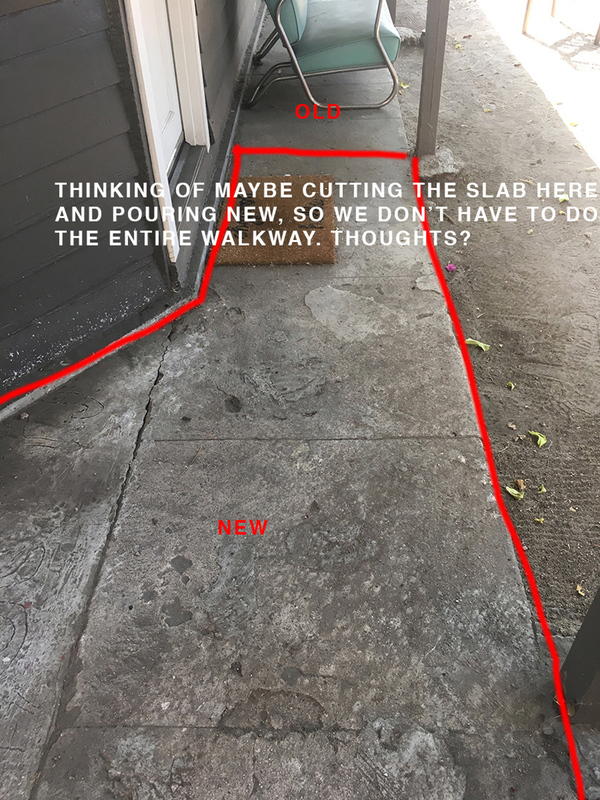 I asked him if he could obtain an install these plastic edge pieces in order to create delineations between the rocks/turf/decomposed granite (light brown stuff that running paths are made out of). He gave me a long speech about how he uses the best products so the project was going to cost $1800 for materials and labor. I totally fell for it. Once the edges were installed, I felt like they looked particularly wonky and cheap so I went to Lowe’s to see if they had anything that would be better for the job, and I come to find out that the product he installed was literally worth $100 and he charged 10 times that. This is when I finally snapped and I decided to sever my relationship with my contractor. I ended up paying him 85% of what he charged me, but I refused to pay the last 15% because he was ripping me off. There were a lot of emails and invoices sent back-and-forth as well as threats of legal action on both ends, but ultimately he accepted my suggestion to take the 85% and end our relationship. I do not think this contractor is a bad person, but he was one of those foremen who comes to the job site for 10 minutes in the morning, blurts some instructions to his team, and then leaves, and doesn’t come back until the next day. I’m not exactly sure how much better this would have been with a different company, but now I know that for me personally, I want to manage all large projects myself from here on out. Once the contractor was gone, everything was pretty smooth from that point on. I did a lot of the work myself, but I hired specialists to do specific jobs (a turf guy to do the turf, an electrician to do the electrical.) And then my AMAZING friends Jef and Michael came on board to finish the deck. pin it!Jef and I tiled the concrete slab together which was relatively straight forward because we had tiled some stuff at my Richmond house a few months prior. 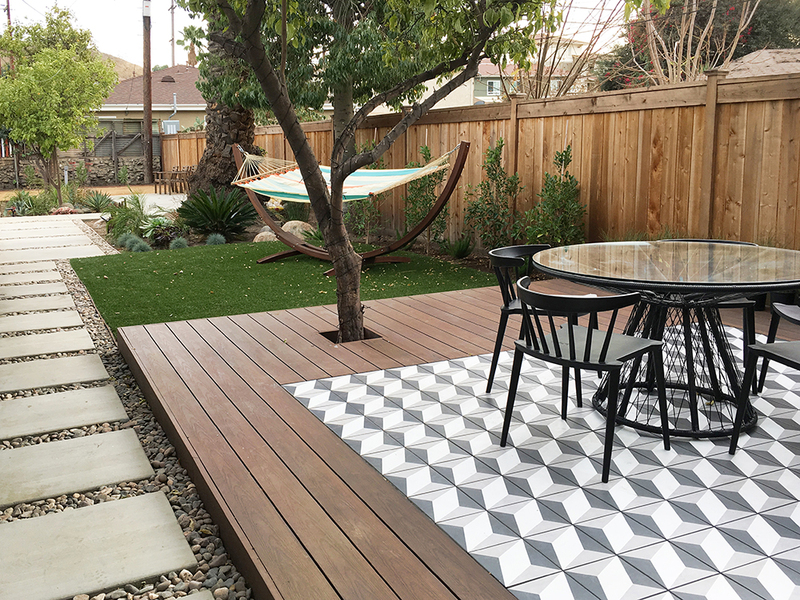 pin it!My brilliant carpenter friend Michael Forbes built the deck to my specifications. He even built it at a 2 degree slant for drainage and worked around my lemon tree! It’s perfect, I love it so much! 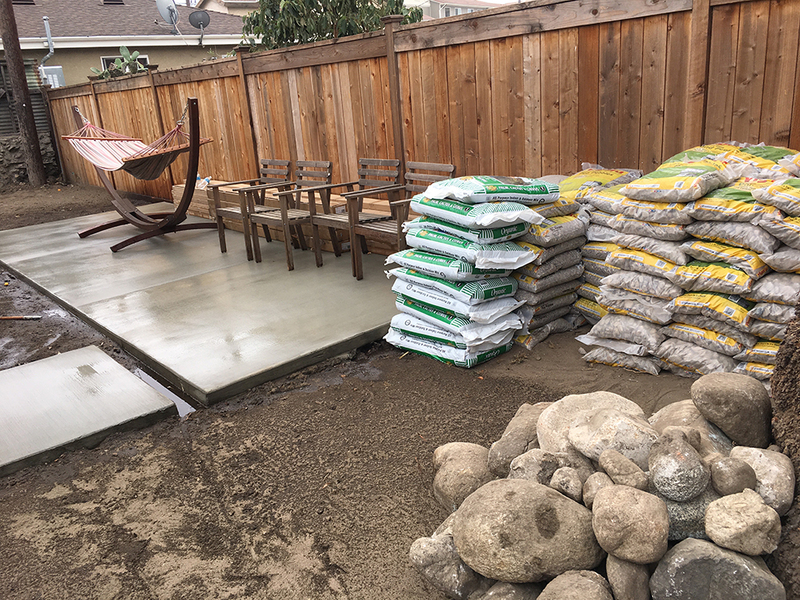 pin it!I had to haul 7000 lbs of landscaping rock to go between all the concrete pavers.That was a blast. 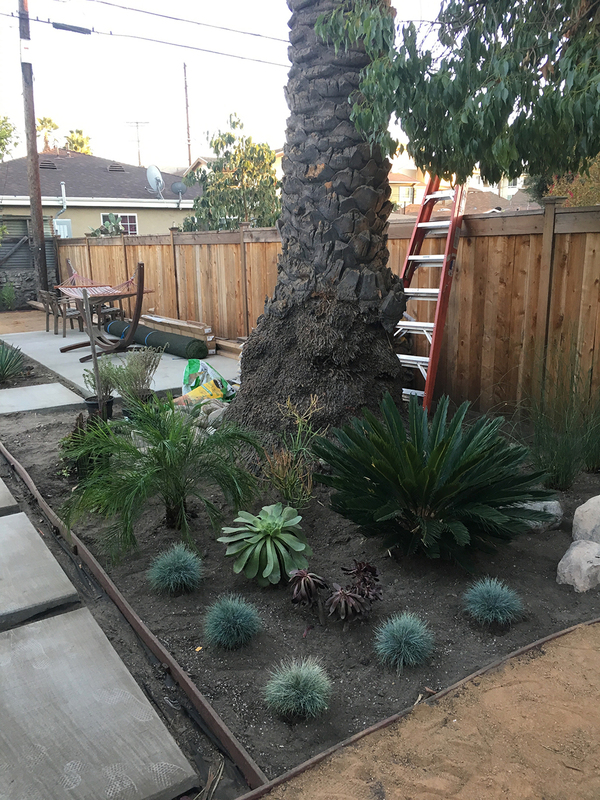 pin it!I bought a zillion plants and plopped them into the ground. This is a view from the back of my lot toward the house. I decided to hold off on deck #2 on the right because I was hemorrhaging money faster than I was earning it. 1) Level and flat are two completely different things, and when you’re talking about that in a landscaping context, you have to be ultra clear what you’re trying to say. 2) Whatever you think your landscaping budget is, DOUBLE IT. And then double it again. 3) Just because someone says they “can do everything,” that doesn’t necessarily mean that they’re great at everything or will give you a fair price. Contractors outsource, too and mark up everything. It may be worth it to find your own specialists to come in and perform the service that they advertise, even if it’s more work. 4) Try to be at the job site as much as possible. I’ve been working in the business of designing/building for 13 years, and I’m still surprised how often mistakes are made by all parties. Also, if you have to hire a contractor to manage a project, ask if that person plans on being on the job site regularly.